Brora: Brora, like Golspie, may not be as well known as Royal Dornoch but is a course every holiday and competitive golfer will enjoy. Broras open spaces and lack of heavy rough makes for a brisk, trouble-free round. 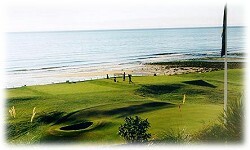 It still provides a challenge however, as excellent use is made of the natural contours on its seaside links. The course is 18-hole, par 69 and open all year. Telephone: +44 (0)1408 621417.